For other uses, see Eos (disambiguation). In Greek mythology, Eos (/ˈiːɒs/; Ionic and Homeric Greek Ἠώς Ēōs, Attic Ἕως Éōs, "dawn", pronounced [ɛːɔ̌ːs] or [héɔːs]; Aeolic Αὔως Aúōs, Doric Ἀώς Āṓs) is a Titaness and the goddess of the dawn, who rose each morning from her home at the edge of the Oceanus. Eos is cognate to the Vedic goddess Ushas, Lithuanian goddess Aušrinė, and Roman goddess Aurora (Old Latin Ausosa), all three of whom are also goddesses of the dawn. All four are considered derivatives of the Proto-Indo-European stem *h₂ewsṓs (later *Ausṓs), "dawn", a stem that also gave rise to Proto-Germanic *Austrō, Old Germanic *Ōstara and Old English Ēostre / Ēastre. This agreement leads to the reconstruction of a Proto-Indo-European dawn goddess. 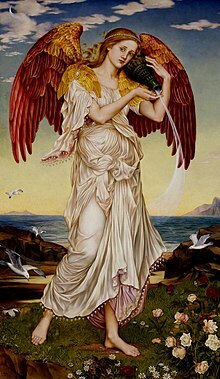 Eos was the daughter of the Titans Hyperion, a bringer of light, the One Above, Who Travels High Above the Earth and of Theia, The Divine, also called Euryphaessa, "wide-shining" and Aethra, "bright sky". She was the sister of Helios, god of the sun and Selene, goddess of the moon, "who shine upon all that are on earth and upon the deathless gods who live in the wide heaven". The generation of Titans preceded all the familiar deities of Olympus who largely supplanted them. In some accounts, Eos' father was called Pallas. Eos married the Titan Astraeus ("of the Stars") and became the mother of the Anemoi ("winds") namely Zephyrus, Boreas, Notus and Eurus; the Morning Star, Eosphoros (Lucifer); the Astra ("stars") and the virgin goddess of justice, Astrae ("starry one"). Her other notable offspring were Memnon and Emathion by the Trojan prince, Tithonus. Sometimes, Hesperus, Phaethon and Tithonus (different from the lover) were called the children of Eos by the Athenian prince, Cephalus. The dawn goddess Eos was almost always described with rosy fingers (ῥοδοδάκτυλος, rhododáktylos) or rosy forearms (ῥοδόπηχυς, rhodópēkhys) as she opened the gates of heaven for the Sun to rise. In Homer, her saffron-coloured robe is embroidered or woven with flowers; rosy-fingered and with golden arms, she is pictured on Attic vases as a beautiful woman, crowned with a tiara or diadem and with the large white-feathered wings of a bird. "But soon as early Dawn appeared, the rosy-fingered, then gathered the folk about the pyre of glorious Hector." "That brightest of stars appeared, Eosphoros, that most often heralds the light of early-rising Dawn (Eos Erigeneia)." "And after these Erigeneia ["Early-born"] bore the star Eosphoros ("Dawn-bringer"), and the gleaming stars with which heaven is crowned." Eos' team of horses pull her chariot across the sky and are named in the Odyssey as "Firebright" and "Daybright". While Quintus pictured her exulting in her heart over the radiant horses (Lampus and Phaëton) that drew her chariot, amidst the bright-haired Horae, the feminine Hours, climbing the arc of heaven and scattering sparks of fire. Eos, the rosy-fingered, saffron-robed and golden-throned goddess, who goes up to Olympus to announce the light to the immortals, fell in love several times. According to Pseudo-Apollodorus, it was the jealous Aphrodite who cursed her to be perpetually in love and have an unsatisfiable sexual desire because once had Eos lain with Aphrodite's sweetheart Ares, the god of war. This caused her to abduct a number of handsome young men, most notably Cephalus, Tithonus, Orion, and Cleitus. The good-looking Cleitus was made immortal by her. She also asked for Tithonus to be made immortal, but forgot to ask for eternal youth, which resulted in him living forever as a helpless old man. According to Hesiod, by Tithonus, Eos had two sons, Memnon and Emathion. Memnon fought among the Trojans in the Trojan War and was slain. Her image with the dead Memnon across her knees, like Thetis with the dead Achilles are icons that inspired the Christian Pietà. 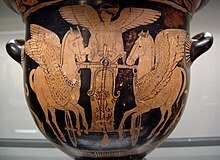 The abduction of Cephalus had special appeal for an Athenian audience because Cephalus was a local boy, and so this myth element appeared frequently in Attic vase-paintings and was exported with them. In the literary myths, Eos kidnapped Cephalus when he was hunting and took him to Syria. The second-century CE traveller Pausanias was informed that the abductor of Cephalus was Hemera, goddess of Day. Although Cephalus was already married to Procris, Eos bore him three sons, including Phaeton and Hesperus, but he then began pining for Procris, causing a disgruntled Eos to return him to her and put a curse on them. In Hyginus' report, Cephalus accidentally killed Procris some time later after he mistook her for an animal while hunting. In Ovid's account, Procris, a jealous wife, was spying on him and heard him singing to the wind, but thought he was serenading his ex-lover Eos. "[Eos addresses Zeus :] ‘Least I may be of all the goddesses the golden heavens hold--in all the world my shrines are rarest.’"
Ovid may therefore have known of at least two such shrines. Among the Etruscans, the generative dawn-goddess was Thesan. Depictions of the dawn-goddess with a young lover became popular in Etruria in the fifth century, probably inspired by imported Greek vase-painting. Though Etruscans preferred to show the goddess as a nurturer (Kourotrophos) rather than an abductor of young men, the late Archaic sculptural acroterion from Etruscan Cære, now in Berlin, showing the goddess in archaic running pose adapted from the Greeks, and bearing a boy in her arms, has commonly been identified as Eos and Cephalus. On an Etruscan mirror Thesan is shown carrying off a young man, whose name is inscribed as Tinthu. The Roman equivalent of Eos is Aurora, also a cognate showing the characteristic Latin rhotacism. Dawn became associated in Roman cult with Matuta, later known as Mater Matuta. She was also associated with the sea harbors and ports, and had a temple on the Forum Boarium. On June 11, the Matralia was celebrated at that temple in honor of Mater Matuta; this festival was only for women during their first marriage. ^ Nonnus: "Eos had just shaken off the wing of carefree sleep (Hypnos) and opened the gates of sunrise, leaving the lightbringing couch of Kephalos." (Dionysiaca 27. 1f, in A.L. Rouse's translation). ^ Mary R. Lefkowitz, "'Predatory' Goddesses" Hesperia 71.4 (October 2002, pp. 325-344) p. 326. ^ Pausanias remarking on the subjects shown in the Royal Stoa, Athens (i.3.1) and on the throne of Apollo at Amyklai (iii.18.10ff). ^ Marilyn Y. Goldberg, "The 'Eos and Kephalos' from Cære: Its Subject and Date" American Journal of Archæology 91.4 (October 1987, pp. 605-614) p 607. ^ Goldberg 1987:605-614 casts doubt on the boy's identification, in the context of Etruscan and Greek abduction motifs. ^ Noted by Goldberg 1987: in I. Mayer-Prokop, Die gravierten etruskischen Griffspiegel archaischen Stils (Heidelberg) 1966, fig. 61. Hesiod, Theogony from The Homeric Hymns and Homerica with an English Translation by Hugh G. Evelyn-White, Cambridge, MA., Harvard University Press; London, William Heinemann Ltd. 1914. Online version at the Perseus Digital Library. Greek text available from the same website. The Homeric Hymns and Homerica with an English Translation by Hugh G. Evelyn-White. Homeric Hymns. Cambridge, MA., Harvard University Press; London, William Heinemann Ltd. 1914. Online version at the Perseus Digital Library. Greek text available from the same website.